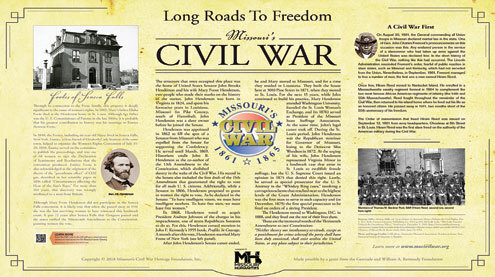 John Brooks Henderson and Mary Foote Henderson are recognized on the “Long Roads to Freedom” memorial, which will be dedicated April 18 in St. Louis. The public ceremony is at 10 a.m. in J.B. “Jet” Banks Memorial Park at Olive and Cardinal Avenue on the north side of the Harris-Stowe University campus. The Missouri Humanities Council donated the $1,500 tribute, which is three feet wide and two feet tall. Funding came from the council and a grant by the Gertrude and William A. Bernoudy Foundation. Greg Wolk, Heritage Programs Coordinator for the Humanities Council, said there is “historic significance” to the site because it once featured a home owned by the Hendersons in the late 1860s and early 1870s. Also featured on the sign is Hiram Reed, a Union soldier who the first slave freed during the Civil War. John Brooks Henderson was born in Virginia and moved with his family to Missouri at age six. Four years later, both his parents were dead. Henderson lived with a farm family until he could strike out on his own, first as a teacher and then as a lawyer. He served as a state lawmaker and as a brigadier general in the Union army before being named to the U.S. Senate in 1862. Henderson met regularly with President Abraham Lincoln, who wanted to keep Missouri from seceding. Though once a slave owner, he introduced the 13th Amendment on Jan. 11, 1864, and it was approved by Congress a year later. Though not required, Lincoln signed it as a show of support. Henderson was one of seven Republicans who broke party lines and voted to acquit Democrat President Andrew Johnson of impeachment charges in 1868. It marked the end of his political career, and he left the Senate the next year. The Whiskey Ring federal tax conspiracy trials brought Henderson back into the limelight in 1875, but he was fired as a special prosecutor by Republican President Ulysses S. Grant after challenging Grant’s alleged interference with the case. Mary Foote Henderson was 15 years younger than her husband. Born to a prominent family in upstate New York, her father was a lawyer and judge. Her mother was a scientist and social reformer. An uncle, Samuel Foote, was a U.S. Senator from Connecticut. Mary met John on a trip to Washington, D.C., and they were married in June 1868. They first lived in Louisiana before moving to St. Louis and later Washington. Mary Henderson wrote books on health and social activities, championed women’s voting rights, became a real estate developer and was a strong temperance advocate. In 1906, she famously poured dozens of bottles of expensive wine from her husband’s decades-long collection into the gutter outside their Washington home. In addition, Mary worked on city beautification efforts in the Meridian Hill Park area, which was known for homes that served as embassies for foreign diplomats. She tried unsuccessfully to have a replacement for the White House built in the neighborhood. John Henderson died at age 86 in 1913 and Mary Henderson passed at 88 in 1931. A bust of John Henderson was dedicated during Louisiana’s bicentennial celebration on July 4, 2018. It stands in Henderson Riverview Park, land which the couple donated to the city in 1903. Wolk sees tie-ins from the Henderson era to today.